Queen duvet cover (88" x 88") featuring the image "Hammer Away Big Guy" by Kym Backland. Our soft microfiber duvet covers are hand sewn and include a hidden zipper for easy washing and assembly. Your selected image is printed on the top surface with a soft white surface underneath. All duvet covers are machine washable with cold water and a mild detergent. JOSE, Thank you so much for the feature of my photo HAMMER AWAY BIG GUY in your group STOP TIME WITH ART! You are so generous with your time Jose! Great work Kym...I liked this tone. Beto, Thank you for your time and comments.. Maybe you like the color purple too? Steve, Thanks so much for featuring my photo HAMMER AWAY BIG GUY in your group URBAN IMAGES... I really appreciate it Steve! Eddie, thanks so much! I'm glad that you like it, some people don't like me changing it to PURPLE! Appreciate your favorite and votes! jjr... Wooooh I didn't realize it was a TRIPLE FEATURE! 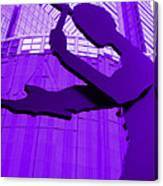 Wow, thank you very much for the feature of my photo HAMMER AWAY BIG GUY in your group LOVING THE COLORS PURPLE.. I think I should start my own gallery that is PURPLE PHOTOS.. Thanks so much jjr! Michael, Thank you so much for the feature of my photo HAMMER AWAY BIG GUY in your group ANYTHING AND EVERYTHING PHOTOS. I really appreciate that. Long time no see... Hope your October is starting off with a bang! Thanks again! Heiko and Helga, (Your names together have a nice "ring" to them together!) Thank you for stopping by and giving me your vote! Much appreciated! Krista, Thanks for the feature of my photo HAMMER AWAY BIG GUY in your group SILHOUETTES. Guy, Thanks so much. You are so kind to take so much time to give a "critique" along with your comments and compliments.. Thanks for appreciating the lines on the building..It's a gorgeous building! 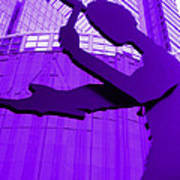 The world looks better in purple...haha..thanks for the votes and favoriTING too! 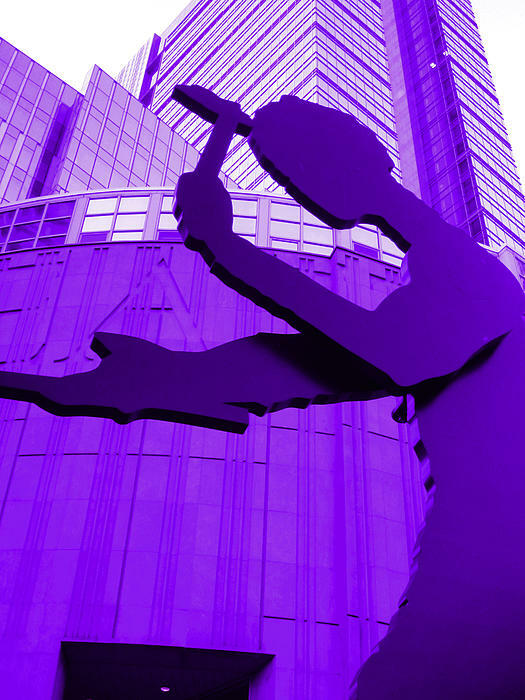 I like seeing the Hammering man in PURPLE just for my OWN asthetic..but the real story of THE Hammering Man is He lives in Seattle is (48 feet) tall, (30 inches) wide and 7 inches deep, and weighs 26,000 pounds.He is located directly in front of the Seattle Art Museum and made out of hollow-fabricated steel with a mechanized arm of aluminum, an electric motor and flat black automotive paint. He was built in 1992 at a cost of $450,000. Hammering Man's arm "hammers" silently and smoothly four times per minute from 7 a.m. to 10 p.m. every day. It runs on a 3-hp electric motor set on an automatic timer. Hammering Man rests his arm each evening and every year on Labor Day. On Labor Day 1993, a group of local artists attached a scaled-to-fit ball and chain to the sculpture's leg.